Webster Vienna hosted its first WEBTalks, a Dec. 2 event welcoming three extraordinary Webster-associated speakers for an evening of TED Talk-style insights from the guest speakers’ experience and success in their respective fields. Vladimir Ivkovic, a Webster alumnus from the Vienna campus who works with NASA as director of the Laboratory for Neuroimaging and integrative Physiology Neural Systems Group at the Missouri General Hospital and Harvard Medical School. 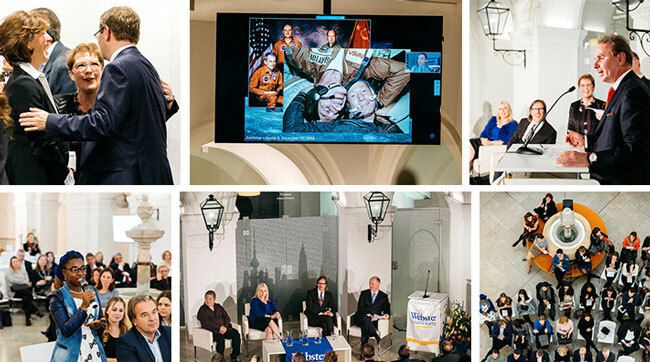 Ivkovic could not travel for the event but spoke via videoconference from Boston, capturing the attention of attendees via screens in the Palais Wenkheim atrium. In addition to event sponsors, alumni, local faculty staff and students in attendance, the event was opened by Elizabeth (Beth) J. Stroble, Webster University's president, and Julian Schuster, Webster’s provost senior vice president and chief operating officer. Stroble said she was struck by how the commonality of these three very different speakers was "brought into sharp relief" -- to see that "all of us are seeking to find a better way to live our lives, to advance our careers,” she said. "And this bond of humanity: How will we see that life will be better and more inclusive for everyone, as opposed to increasingly isolated and separated?" "It's terrific," Randolfph said, seeing so many former classmates from around the world. "You know, Webster's truly such an international place, that it's lovely to come back and see how all of these students have done well in their own cultures." Johannes Pollak, professor and interim director of Webster Vienna, called the event fascinating and saits its success bringing people together highlights the "need to showcase the enormous amount of talent Webster has." See more photos of the event in this Flickr album.